Heel pain is an extremely common complaint for people who spend a lot of time on their feet. It is rare for anyone to go through life without a bout of heel since that most people take up to of 10,000 steps a day! That is a lot of pounding on your heels. The biggest problem with heel pain is that it’s hard to do anything when it feels like there is a nail stuck in your foot! It affects everything you do including work, playing with your kids, and your exercise routine. Plantar Fasciitis is the most common cause of the heel pain we see in our clinics. The plantar fascia is a band of connective tissue that supports the arch of your foot. When this connective tissue gets inflamed, it’s hard for your body to resolve the problem without help from a physical therapist because of the thousands of times a day you take a step and irritate it. Other causes of heel pain include medial and lateral plantar nerve irritation and a fracture in the heel. Finding out the cause is the first step you need to take to get rid of it. That depends on what is causing your heel pain. That is why it is so important to find the cause. The good news is that most heel pain resolves with physical therapy and does not require surgery. In our clinics, the largest indicator of success in terms of eliminating the pain and the length of time it takes to get rid of the pain, is how quickly our therapists get our hands on the problem. The good news is that 95% of heel pain patients achieve a successful outcome with physical therapy and avoid surgery. No. Pennsylvania and New Jersey are Direct Access states. This means you do not need to go to your doctor to get a prescription. We work closely with several podiatrists in the communities we serve, so if you do need to see a doctor, we will set that up for you. Will my heel pain go away on its own? It’s possible, but not likely. Unfortunately, most of our heel pain patients think “Well, maybe it will just go away.” The problem with that is, the longer you go with heel pain, the longer it takes us to fix it. Pain is a warning signal in your body telling you something is wrong. Waiting for the pain to go away is not a good strategy. 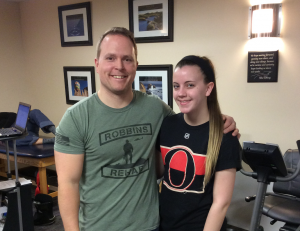 The quicker you get in to see a qualified physical therapist, the faster you can be on your road to recovery. I liked my experience here better than other places I’ve been, not only because the treatments worked better, but also because the therapists seem to care more. I like constantly working with the same therapist. I had daily pain in my foot before coming here, and after treatment it’s a relief to go through the day without pain. The one-on0one personalized work with Travis definitely helped more than other places.